It’s not the first time ballet and juggling have been paired at the Fringe – 2013’s Tangram saw the disciplines turned into a tender duet by a husband and wife. But director Sean Gandini and choreographer Ludovic Ondiviela know the value of numbers when creating spectacle, and here the virtuoso cast of eight (four jugglers, four ballet dancers) creates a human kaleidoscope of quick-moving beauty, all set to Nimrod Borenstein’s original score. 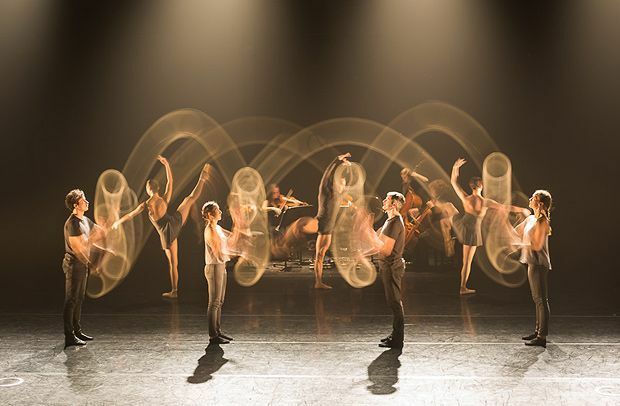 It would be enough to see the electrons of juggling patterns fizzing against the dancers’ clean lines, or even to gape at the timing that allows the ballet to weave in and around flying hoops, skittles and balls. But this is Gandini Juggling, of smash-hit Smashed, here, and the same puckish spirit of that teacup-worrying Pina Bausch-inspired show is embedded firmly in 4x4. In interludes between meditative, lyrical movements – playing with ideas of codes and equations – we have good-cop-bad-cop dancers who try to distract a solo juggler, then golf clap him when he gets it right, and ballerinas who cackle like monkeys when you least expect it. Randomness always tickles against the order imposed by the company’s immaculate choreography. There is no reason for the word ‘whee’ to be funny, but when it escapes a ballerina’s mouth mid-lift, it just is. We laugh, but actually it’s a fair way to describe this show. Assembly George Square Theatre, 623 3030, until 30 Aug (not 12, 18, 25), 5.30pm, £14–£16 (£12–£14). Four jugglers and four ballet dancers collaborate on a contemporary dance piece.